Be honest: is your daily standup meeting (or daily Scrum) highly valuable, or is it really just a status meeting where everyone goes through the motions, answering the standard three questions like zombie automatons? Let’s start with why. What is the purpose of the daily stand up? We also have a set of lean & agile principles to guide us in the daily standup. The standard format of three questions (What did you achieve? What will you achieve? What impediments are in your way?) too easily devolves into a mere status meeting, failing to achieve the purpose of the daily standup and failing to embody these principles. A mature team must first understand the goal, follow the principles, and then skillfully apply the appropriate tools and techniques to achieve the goal for the daily standup. Here are a few techniques to add to your toolbox. A set of three different questions as suggested by Olaf Lewitz. What did we (as a team) achieve to get closer to the sprint goal? What is blocking us from focusing on the sprint goal? What do we agree on doing today to make sure we reach the sprint goal? What did I achieve since last time? What impediments are still in my way? What do I commit to achieving today? Which story will we finish today? Gather around your team’s task board (or kanban board). 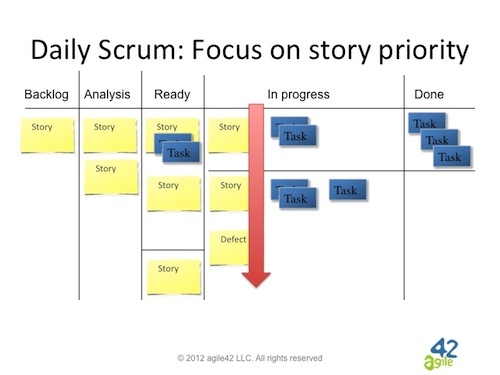 Start with the highest priority story/feature in progress. Ask what we, as a team, can do to get that story done (per our Definition of Done). Ask what is blocking us, as a team, from getting the story done. Repeat steps 3-4 for the next few priority items, up to your team’s WIP limit. To finish, validate that everyone on the team has been heard and all are focused on the top priority stories. As with any complex system such as a product development team there is no one best practice. A good ScrumMaster will carefully consider the context and situation before deciding how to facilitate the meeting, and will likely try new techniques to keep it interesting and innovative. Have you found an effective way to facilitate the daily standup? Leave us a comment. Agility is often misunderstood and misinterpreted. To understand what's behind agility, you need Agile Reading Glasses. Brad Swanson started his software career at age ten on the Apple IIe and is now a Certified Scrum Trainer® and Coach with eighteen years of experience in management, project and program leadership, product management, and software development.